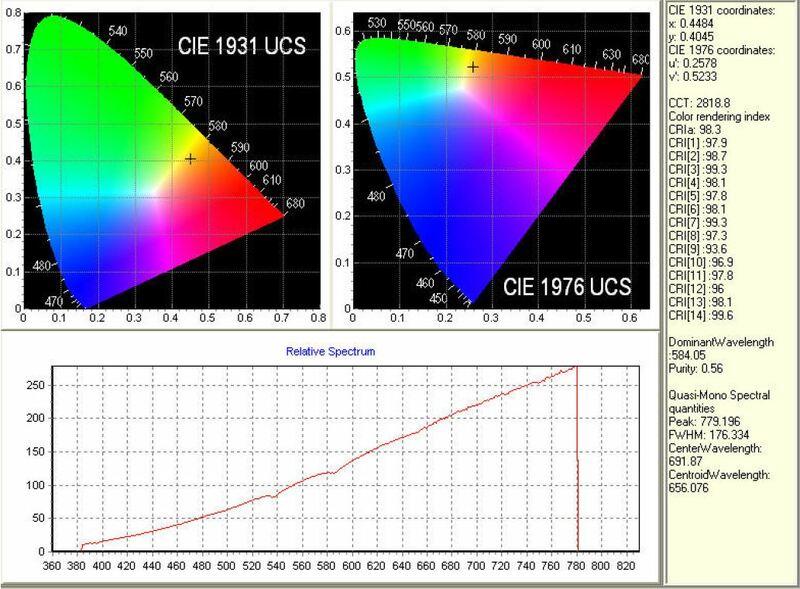 To compliment a standard light meter, which does a fine job collecting illuminance information, I sought a low cost solution to evaluation of color data, specifically CCT, spectral power distribution and CRI. My goal was to find a product under $2,000, that could be calibrated, that would deliver me color information simply and without a large amount of special technical effort. I found that in the Mightex CCD Spectrometer. At a base price under $1,700, it fit the budget nicely. Of course I added a few accessories to it, and paid them to calibrate the meter with a fiber optic mounted cosine sensor, which increased the total invoice to a touch beyond the $2,000 target… However, in the end, I found the results to be exactly what I was looking for – almost. The CCD based (same technology as high resolution cameras) spectrometer is that it holds its precision over a wide range of temperatures and for long periods of time before requiring re-calibration. While the software is not as slick as the previously mentioned Orb Optronix SP-100, it is certainly functional, and delivers the information I wanted from it. It calculates CCT and CRI, and presents it in both graph and graphic formats. The spectrometer’s raw data can also be downloaded in a file format usable for evaluation in spreadsheet form. Connecting the meter to a computer is as simple as plugging in the USB cable, which also provides the power to the unit. 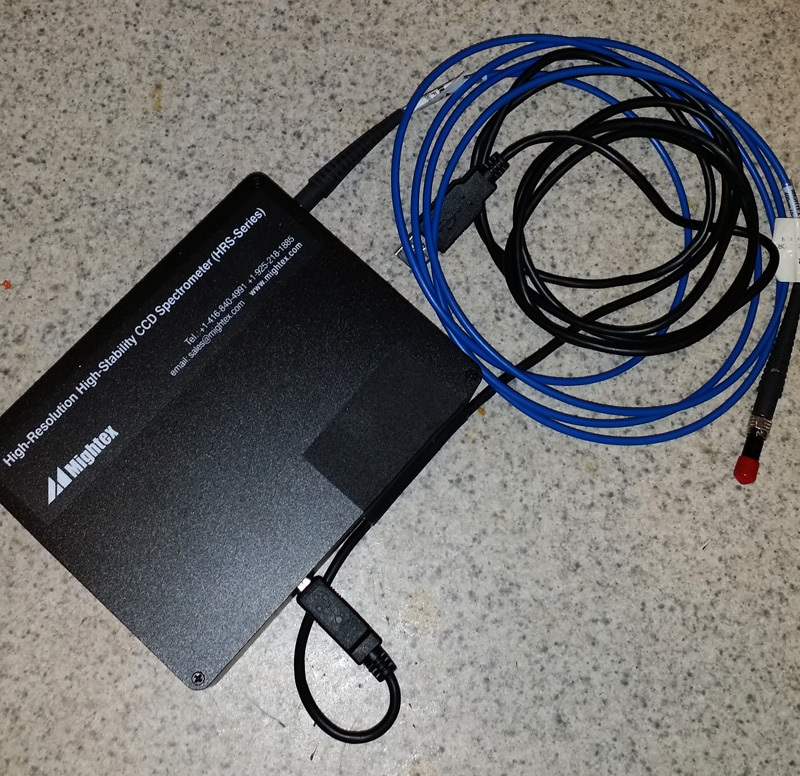 I use a fiber optic cable from a cosine correction end attachment, as this allows me to leave the box and its connection to a laptop on a table, while reaching up to ceiling products, or fixing the reception head to a holder for lab testing on the goniometer. The output reports are very easy to read, and show all the information I need them to, including individual R values in the CRI calculations, and pertinent color coordinates in both numeric and graphic format. For the money, it delivers most of what much more expensive equipment provides, in a very simple to use and apply unit. The software does take a few moments to figure out. Of particular issue is selecting an appropriate sample rate, sample number, and integration time to create the most accurate CCT and CRI result. This is usually done by experimenting with various settings in the operating software until a smooth spectral distribution curve is created. 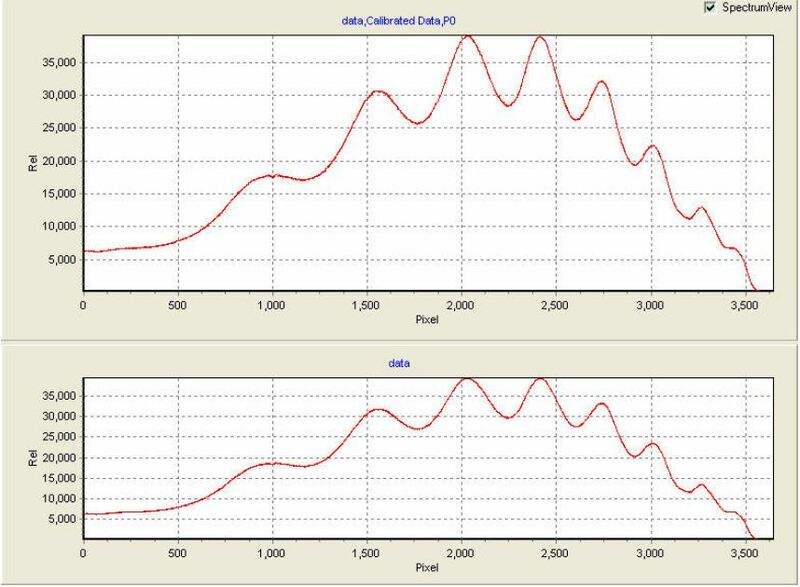 A smoothing function can also be applied to improve results. This is not going to be a user-friendly device for anyone who is not familiar with photometric testing using spectrometers. Failing to apply the proper settings creates wildly erroneous results that will be confusing to those who are not familiar with what causes them. One missing piece that needs mentioning, is that the Mightex does not produce illuminance values in any form usable in architectural lighting. The data can be read in absolute irradiance as uW/cm2, which can be translated and converted to other forms. I needed this exact data for one customer in the UV light curing business. However, for the most part, the data is most useful in spectral power distribution evaluation as presented without bothering with any such effort. For my uses, other meters provide me the photometric data I need without relying on the Mightex for use beyond color evaluation and performance. Overall, this is a nice tool for those looking to create a low cost lab setup. For the architect, lighting designer, or electrical engineer looking for a portable light meter solution with CCT and CRI capability, it is probably not an ideal solution.